Catamaran Sailing is Different - But How? 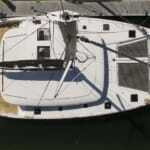 A traditional sailboat is a monohull–in other words, it has only one hull centered around a heavy keel. A catamaran is balanced on two hulls, with the sails in the middle. It’s as simple as that. Depending on the size of the boat, the space separating the two hulls might be filled by a cockpit, a main cabin, and usually some netting (which can be a great place for relaxing in the sun). Size and stability are the main factors. With two hulls and the space in between, there tends to be more room on a catamaran, both above and below decks. Vacationers chartering a boat love cats for this reason. There’s space for a lot of people and a lot of stuff. Additionally, the stability offered by having two hulls means that the boat doesn’t heel over like a monohull–it stays pretty much level. This means the sailing experience is less tiring, as you aren’t battling gravity. Catamarans don’t need as much water underneath them, so you can sail in shallower places than a monohull, and in your anchorage at night you won’t roll around. There’s also a bit more privacy for those onboard, as the two hulls are completely separate from one another. Lastly, they tend to be faster! 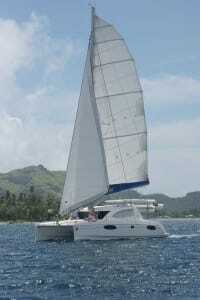 How is Catamaran Sailing Different from Monohull Sailing? As noted above, catamarans don’t really heel over. This makes the entire sailing experience different; the motion of the boat is different, you have to trim the sails differently, and pay attention to other factors that you might not be used to. In light wind and upwind sailing conditions, it can be harder to make headway. When the wind is strong, because the boat doesn’t seem to “react” to the wind, it can be more challenging to tell when you are overpowered and need to reef. In heavy weather (which most casual sailors tend to avoid) a catamaran can be a liability, though with the proper training they can be handled safely. When the conditions are right, catamarans are sweet sailing, smooth performing, and comfortable, so it’s no surprise that more and more of them are appearing in the world’s best sailing destinations. Where Can I Get Training in Catamaran Sailing? 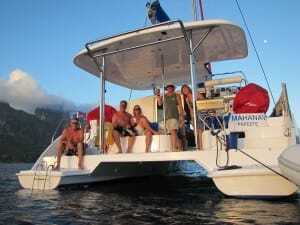 In response to their rise in popularity, ASA developed a new course, 114: Cruising Catamaran. This course is ideal for people who already have monohull cruising experience and want to translate that over to the catamaran. 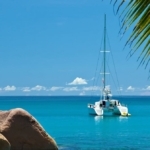 You’ll learn all the advantages and disadvantages of multihull sailing so that you’ll always be making an informed decision when considering which boat to charter or buy. You’ll also get the practical sailing skills you need to be confident and have a great time on your cat. Contact an ASA school near you to see if they offer ASA 114: Cruising Catamaran. I’ve only had one experience sailing a cruising cat..that being a 5 day charter on a PDQ 32 in the North Channel of Lake Huron. I sailed with my 4 brothers and father…all 6′ guys. We thought this boat provided us with great stability and sailing while providing more then adequate room for the 6 of us. We had previously only chartered mono-hulls, but my father had lost his arm the year before and the stability of of the catamaran allowed us to keep sailing with him being comfortable and safe. Catamaran sailing vacations are great for everyone…even people shorter than 6′! As far as the cats heeling – they hardly do for one very simple reason – width to length ratio. The oceanliner Oasis of the Seas is 1186′ long and only 198′ in width, and 30′ of the width is below the waterline – width is about 15% of the length. In comparison the catamaran Marmot is 67′ long and 37′ width which is 55% of the length hard to roll even in stiff winds and high seas!